Game of Thrones Christmas Ornaments | Nerd Much? We’ve already featured a few nerdy Christmas decorations so far this year, but we’re not going to stop. Why? Because nerding out your Christmas is awesome. 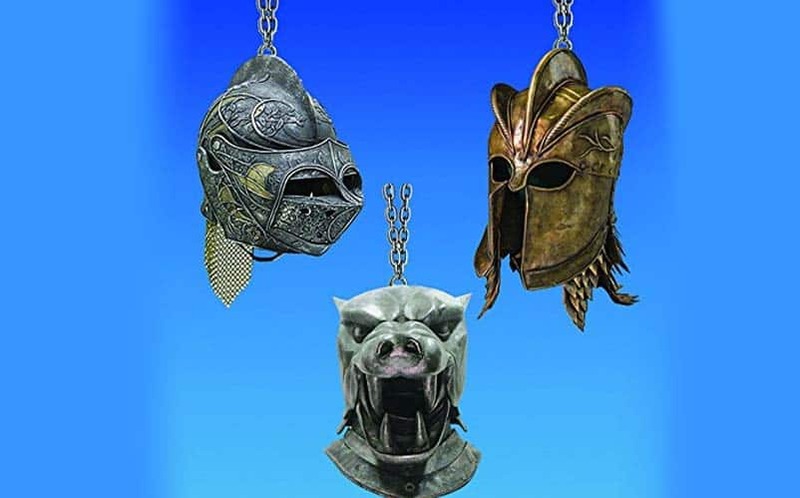 So, check out these Game of Thrones Helmet Ornaments by Kurt Adler, three awesomely-designed mini helmets originally seen on the heads of Westeros’s fiercest warriors in the HBO fantasy TV series. They’re only available in a set of three, and in that set, you get the Hound’s Helm, Loras Tyrell’s Helm and a Kingsguard Helm. Each Game of Thrones helmet is highly detailed, and measures nearly 4″. Sure, there are plenty of other GoT decorations out there, but these are, by far, the best Game of Thrones ornaments we’ve seen so far this year, and if anyone has seen any that are even more impressive, please contact us immediately. For more ridiculously cool nerdy stuff to buy, stay tuned to Nerd Much for daily finds. Bobby is the co-owner of Nerd Much?. He has written for Den of Geek, Heavy, and more about games, toys, and other things nerdtastic. Darkman NES was the game that got him really into gaming, and he mains Hanzo.